We have just received a response to our campaign/petition, shown below, from the City of Irvine – and once again they didn’t let us down. We are very grateful to Mayor Choi and all of Irvine City Council, and its staff, for taking such immediate action to help the Korean dogs in the meat trade, and for being their voice! We are pleased to say that this is our 6th victory, even though we don’t yet know how Seoul’s Nowon District will respond. And, we are sure that, as a result of our campaigns, there are many more cities/states contacting their counterparts in Korea to address this issue, even though they have chosen not to respond to us. These Sister City campaigns, that put a spotlight on the Korean Government’s shameful indifference, are effective and therefore very important. So please keep up the great work and stay with us as we take on each one of the 162 such relationships, one by one. It could take many years to cover them all but we will not stop until Korea ends this brutality. 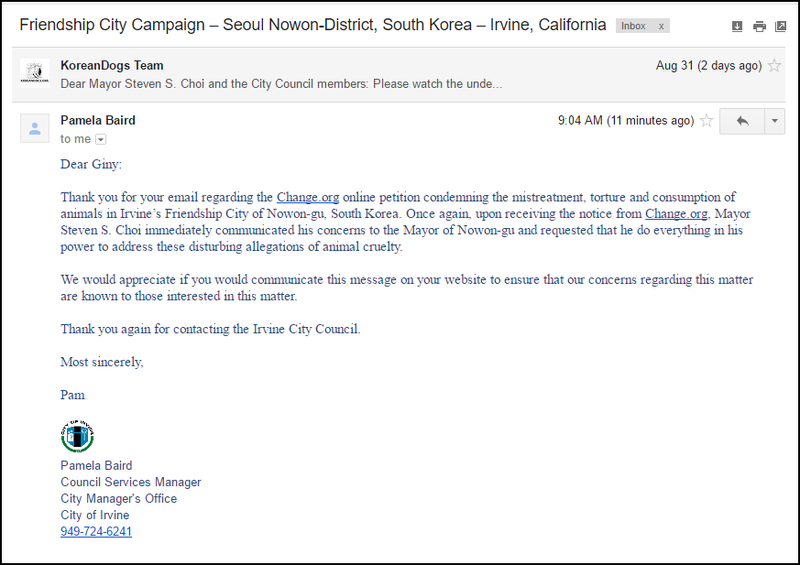 Once again I would like to thank you and the City Council of Irvine for responding to our concerns raised, via the recent petition on Change.org, about the mistreatment, torture and consumption of companion animals in Irvine’s Friendship City, the Nowon District of Seoul. Both domestic and international pressure on this issue is required if we are going to incite some real change in South Korea, so I kindly urge you to continue reaching out to your Friendship City until affirmative action is taken, by the Nowon District, to end the horrific practice of the dog-meat trade for good. Where do you see nice people and beautiful country in Korea ??? I only see unbearable cruelty towards animals, and a country filled up with monsters and psycopaths ! TY.The grotesque and cruel treatment of animals to make them taste better, animals that have been domesticated as companion animals to civilized people, this must stop. There can be no respect for people capable of such unspeakable brutality. Thank you for giving us hope. Mayor Steven S.Choi and City Council of Irvine, Many thanks for doing your part to stop the horrific torture and lack of compassion re: the dog and cat consumption of these innocent animals who can not ask for mercy themselves and depend on animal lovers to ask for them. Sincerely, Suzanne Billings. Thank so much for your interest in protect the dogs and cats ? THANK YOU FOR STOP TORTURE TO ALL ANIMALS. IT IS NECESSARY LAWS AGAINST CRUELTY ON ALL ANIMALS ! IN ITALY WE PUNISH THOSE WHO TORTURE OR MISTREAT ANIMALS, IT IS FORBIDDEN !!!!! Thanks so much. Keep up with this fight. I still don’t see how any human being can be capable of doing the things I’ve been reading about. savages eat rats. SAVAGES! SAVAGES! SAVAGES! Thank you it takes a nation!!! THANK YOU – this inhumane torture & CONSUMPTION of these animals MUST be stopped for good! City of Irvine , WE LOVE YOU! Thank you for having the courage to suggest the Sister City needs to stop these inhumane , sadistic, demonic acts against God’s creations. We in the U.S. love our dogs and want to bring S. Korea around to appreciating their value as companions – not as tortured parts in a soup! We have also contacted other U.S. cities which have Sister City status with Korean cities. We hope your city will serve as a shining example of mercy to them. Thank you! Lots of respect from Estonia! Thank you for standing up and recognizing that this is a huge problem in South Korea (as well as many other Asian countries). If they know enough people are watching, perhaps they might actually do something about it. Again, thank you for having the courage to be on board with this. Many Thanks and it’s nice to hear you have a bit of passion to stop this awful cruelty and also good for you to become a human being to help theses poor dogs and cats . may god be with you all the way to fight and thank you again . Thank you for listening to us for fighting for these innocent creatures. You see, I truly believe that animals are the most innocent creatures on God’s green earth. They were not created to be treated like this, they were created for us as humans to love, respect and to be taken care of by us. They shower us with unconditional love no matter what. THANK YOU, THANK YOU, THANK YOU! Thanks for your support .. hope all that ends soon .. Blessings! THANK YOU – this inhumane torture & CONSUMPTION of these animals MUST be stopped for good! STOP AND END THE TORTURING, THE MUTILATIONS AND STOP YOUR FRIGGIN DOG EATING CULTURE. Thank you..Words can’t say how grateful we are!!!!!!!!!!!! Thank you for supporting for this evil things for these dogs that they suffer so much until their death. Your support and help will be big part of stopping this horrible, horrible acts. I really pray and hope this will end soon to treat these poor dogs that they have right to live as they are precious as our children. Sending a big thank you. We will fight until the end of this. FOR GOD’S SAKE, WHO CREATED US ALL….DOGS ARE ALSO HIS CREATURES…LET US DO EVERYTHING AND TIRELESSLY TO END THIS ATROCITY…. Thank you to everyone in Irvine for acting so swiftly to help stop this dreadful suffering. We need a world full of people like you. THANK YOU FOR STANDING UP AND BEING HUMAN! Thank you for showing your concern for God’s creatures. Thank you for having a heart. Please let’s end the brutality against our beloved dogs and cats. the greatful thanks for your positive action in the name of the poor dogs and cats in S. Korea !! Mayor Choi, please be assured we see everything and are very grateful! But this issue must be addressed again and again until changes really happen. Thank you Mayor Choi for your support – we MUST end this cruelty.